Our primer gives you the basics on this sometimes painful type of arthritis, answering the question "What is gout?" while providing prevention and pain-management tips. When uric acid builds up, it can result in sharp crystal deposits in joints, typically in the big toe. Gout is one of the few types of arthritis in which diet seems to play a genuine role. What food causes gout—or, we should say, may contribute to gout? Some studies have found that drinking water or skim milk as your main beverages may help prevent gout attacks; consuming meat, seafood, and sugary drinks and fruits may increase gout risk. So if you have gout or are at increased risk of developing gout, your doctor likely will recommend a diet that limits purine-rich foods and beverages. Our handy checklist of three basic gout relief dos and don’ts will help you avoid the condition or lessen its effect. Uric acid deposits in joints create sometimes severe cases of gout. 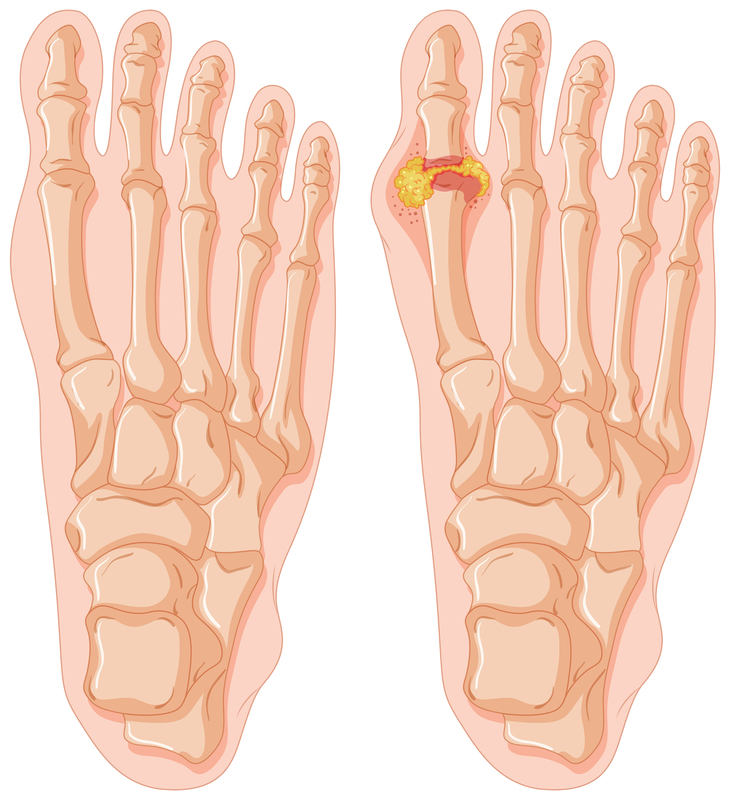 Feet are especially susceptible, but gout also strikes knuckles and hands. Moderate-purine vegetables include asparagus, cauliflower, green peas, kidney beans, lima beans, spinach, and mushrooms. Moderate-purine meats include beef, ham, chicken, duck, and pork. Moderate-purine seafood includes crab, oysters, and shrimp. Oats and oatmeal, wheat germ and bran, and whole-grain breads and cereals are other moderate-purine foods to limit. Vitamin C may have a role in reducing the risk of gout. One study found that men with higher intakes of vitamin C through food and supplements had a reduced risk, while another found that vitamin C supplementation significantly reduced levels of uric acid, which can accumulate and form the crystals that cause gout pain. Painful inflammation and swelling results from uric acid build-up in joints—gouty arthritis. add, arthritis, beer, cauliflower, causes gout, dash diet, diet, food, gout, gout attacks, gout flare, gout foods, gout pain, gout relief, gout remedies, gout symptoms, gouty arthritis, health, health news, high purine foods, how long does gout last, inflammation, milk, pain, purine, purine foods, purine rich foods, purines, spinach, supplements, types of arthritis, university health news, uric acid, uric acid crystals, vegetables, vitamin, vitamin c, what food causes gout, what is gout, whole grain. I have a cure for Gout and you can eat anything you want!It’s called Urcinol !!! There is also Uricelax which is good also.Believe me they work and no side effects! Most gout attacks are a direct result of sleep apnea, which is the frequent cessation of breathing for many seconds at a time during sleep. That’s why most gout attacks originate during sleep! The lack of breathing reduces the oxygen level in the blood, leading to excess generation of uric acid by all the cells in the body, reduced solubility of uric acid in the blood, and reduced kidney function so uric acid is removed from the blood more slowly. These effects lead to an excessively high concentration of uric acid in the blood, perfect storm conditions for it to precipitate as the urate crystals which cause gout when they form in a joint. The best advice I can give to gout sufferers is to insist on being tested for sleep apnea, and to follow the resulting recommended treatment. As long as you follow that treatment, your gout probably will be cured, as it was for me and others that I know. I thought you might be interested in this article on https://universityhealthnews.com: What Is Gout?